A hard disk drive is a sealed unit that a PC uses for nonvolatile data storage. Nonvolatile, or semi-permanent, storage means that the storage device retains the data even when no power is supplied to the computer. Because the hard disk drive is expected to retain data until deliberately erased or overwritten, It is used to store crucial programming and data. As a result, when the hard disk fails, the consequences are usually very serious. A hard disk drive contains rigid, disk-shaped platters, usually constructed of aluminum or glass (see fig below). Unlike floppy disks, the platters can't bend or flex,and that is why it is called hard disk. 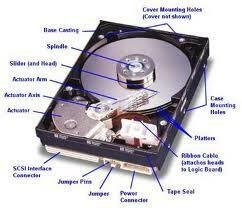 In most hard disk drives, you can't remove the platters, which is why they are sometimes called fixed disk drives. Removable hard disk drives are also available. Usually, this term refers to a device in which the entire drive unit (that is, the disk unit containing the platters as well as the rest of the drive) is removable, but it can also refer to cartridge drives, where the platters are contained in a removable cartridge. 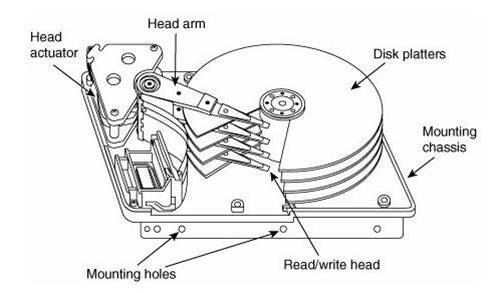 The basic physical construction of a hard disk drive consists of spinning disks with heads that move over the disks and store data in tracks and sectors. The heads read and write data in concentric rings called tracks, which are divided into segments called sectors, which typically store 512 bytes each (see figure below). Hard disk drives usually have multiple disks, called platters, that are stacked on top of each other and spin in same direction, each with two sides on which the drive stores data. Most drives have two or three platters, resulting in four or six sides, but some PC hard disks have up to 12 platters and 24 sides with 24 heads to read them. The identically aligned tracks on each side of every platter together make up a cylinder (see figure below). A hard disk drive usually has one head per platter side, with all the heads mounted on a common carrier device or rack. The heads move radially across the disk in same direction; they can't move independently because they are mounted on the same carrier or rack, called an actuator. A track is a single ring of data on one side of a disk. Many disk tracks can store 100,000 or more bytes of data, which would be very inefficient for storing small files. For that reason, tracks are divided into several numbered divisions known as sectors. These sectors represent arc-shaped pieces of the track. Various types of disk drives split their disk tracks into different numbers of sectors, depending on the density of the tracks. For example, floppy disk formats use 836 sectors per track, although hard disks usually store data at a higher density and today can have 900 or more sectors per track physically. The sectors on a track are numbered starting with 1, unlike the heads or cylinders that are numbered starting with 0. For example, a 1.44MB floppy disk contains 80 cylinders numbered 079 and two heads numbered 0 and 1, whereas each track on each cylinder has 18 sectors numbered 118. When a disk is formatted, the formatting program creates ID areas before and after each sector's data that the disk controller uses for sector numbering and identifying the start and end of each sector. These areas precede and follow each sector's data area and consume some of the disk's total storage capacity. Each sector on a disk usually has a prefix portion, or header, that identifies the start of the sector and contains the sector number, as well as a suffix portion, or trailer, that contains a check sum (which helps ensure the integrity of the data contents). Many newer drives omit this header and have what is called a No-ID recording, allowing more space for actual data. With a No-ID recording, the start and end of each sector are located via predetermined clock timing. A hard disk, however, requires two separate formatting operations. Moreover, a hard disk requires a third step, between the two formatting procedures, to write the partitioning information to the disk. Partitioning is required because a hard disk is designed to be used with more than one operating system. Using multiple operating systems on one hard drive is possible by separating the physical formatting in a procedure that is always the same, regardless of the operating system used and the high-level format (which is different for each operating system). Partitioning enables a single hard disk drive to run more than one type of operating system, or it can enable a single operating system to use the disk as several volumes or logical drives. A volume or logical drive is any section of the disk to which the operating system assigns a drive letter or name. During a low-level format, the formatting program divides the disk's tracks into a specific number of sectors, creating the inter sector and inter track gaps and recording the sector header and trailer information. The program also fills each sector's data area with a dummy byte value or a pattern of test values. Creating a partition on a hard disk drive enables it to support separate file systems, each in its own partition. Each file system can then use its own method to allocate file space in logical units called clusters or allocation units. Every hard disk drive must have at least one partition on it and can have up to four partitions, each of which can support the same or different type file systems. The standard file system supported by DOS and Windows 9x/Me. FAT partitions support filenames of 11 characters maximum (8 characters + a 3-character extension) under DOS, and 255 characters under Windows 9x (or later). The standard FAT file system uses 12- or 16-bit numbers to identify clusters, resulting in a maximum volume size of 2GB. Using FDISK, you can create only two physical FAT partitions on a hard disk drive primary and extended but you can subdivide the extended partition into as many as 25 logical volumes. Alternative partitioning programs, such as Partition Magic, can create up to four primary partitions or three primary and one extended. FAT32 (file allocation table, 32-bit). An optional file system supported by Windows 95 OSR2 (OEM Service Release 2), Windows 98, Windows Me, and Windows 2000/XP. FAT32 uses 32-bit numbers to identify clusters, resulting in a maximum single volume size of 2TB or 2,048GB. NTFS (Windows NT File System). The native file system for Windows NT/2000/XP that supports file names up to 256 characters long and partitions up to (a theoretical) 16 exa bytes. NTFS also provides extended attributes and file system security features that do not exist in the FAT file system. Up until the release of XP, FAT32 was by far the most popular file system. Because NTFS is native to XP, NTFS is now more popular in newer systems. Still, the FAT file system is accessible by nearly every operating system, which makes it the most compatible in a mixed OS environment. FAT32 and NTFS provide additional features but are not universally accessible by other operating systems. Partitioning normally is accomplished by running the disk partitioning program that comes with your operating system. High-level formatting is not really a physical formatting of the drive, but rather the creation of a table of contents for the disk. In low-level formatting, which is the real physical formatting process, tracks and sectors are written on the disk. As mentioned, the DOS and Windows 9x/Me FORMAT command can perform both low-level and high-level format operations on a floppy disk, but it performs only the high-level format for a hard disk. Low-level formats of ATA and SCSI hard disk drives are performed by the manufacturer and should almost never be performed by the end user. The only time I low-level format ATA or SCSI drives is when I am attempting to repair a format that has become damaged (parts of the disk become unreadable) or in some cases when I want to wipe away all data on the drive. During the high-level format, the operating system writes the structures necessary for managing files and data on the disk. For example, FAT partitions have a Volume Boot Sector (VBS), two copies of a file allocation table (FAT), and a root directory on each formatted logical drive. These data structures enable the operating system to manage the space on the disk, keep track of files, and even manage defective areas so they do not cause problems. Read/write heads : The device that reads and writes the information—magnetic or optical—on the disk surface. Head actuator mechanism : This mechanism moves the heads across the disk and positions them accurately above the desired cylinder. Spindle motor (inside platter hub) : The motor that spins the platters. Logic board (controller or Printed Circuit Board) : The logic boards contain the electronics that control the drive's spindle and head actuator systems and present data to the controller in some agreed-upon form. Cables and connectors : Hard disk drives typically have several connectors for interfacing to the computer, receiving power, and sometimes grounding to the system chassis. Configuration items (such as jumpers or switches) : To configure a hard disk drive for installation in a system, you usually must set several jumpers (and, possibly, terminating resistors) properly. These items typically vary according to the type of interface the drive supports but can vary somewhat from drive to drive as well. The platters, spindle motor, heads, and head actuator mechanisms usually are contained in a sealed chamber called the head disk assembly (HDA). The HDA is usually treated as a single component; it is rarely opened. Other parts external to the drive's HDA, such as the logic boards, and other configuration or mounting hardware, can be disassembled from the drive. CD-ROM, or compact disc read-only memory, is an optical read-only storage medium based on the original CD-DA (digital audio) format first developed for audio CDs. Other formats, such as CD-R (CD-recordable) and CD-RW (CD-rewritable), are expanding the compact disc's capabilities by making it writable. Although identical in appearance to CD-DAs, CD-ROMs store data instead of (or in addition to) audio. The CD-ROM drives in PCs that read the data discs are almost identical to audio CD players, with the main changes in the circuitry to provide additional error detection and correction. A CD-ROM drive operates by using a laser to reflect light off the bottom of the disc. The reflected light is then read by a photo detector. The servo motor, on command from the microprocessor, positions the beam onto the correct track on the CD-ROM by moving the reflecting mirror. .When the beam hits the disc, its refracted light is gathered and focused through the first lens beneath the platter, bounced off the mirror, and sent toward the beam splitter. The beam splitter directs the returning laser light toward another focusing lens. The last lens directs the light beam to a photo detector that converts the light into electric impulses. These incoming impulses are decoded by the microprocessor and sent along to the host computer as data. CD recorders allow users to "burn" their own CDs containing music, data, video, or any combination thereof. DVD stands for digital versatile disc and in simplest terms is a high-capacity CD. In fact, every DVD-ROM drive is a CD-ROM drive; that is, they can read CDs as well as DVDs (many standalone DVD players can't read CD-R or CD-RW discs, however). DVD technology is similar to CD technology. The main difference between CD and DVD is that DVD is a higher-density recording read by a laser with a shorter wavelength, focused more closely to the disc, which enables more information to be stored. DVDs share the same physical size of a CD-ROM but can handle a much greater amount of information. DVDs are used for movies and audio, as well as data. Computer DVD drives can also play movies and music as well as read data discs. Manufacturers can now place their entire program on a single DVD instead of multiple lower capacity CDs. A DVD drive can read DVDs and CDs while a CD-ROM drive can only read CDs.